Spine surgery is facing increased payer scrutiny due to the number of spinal procedures expecting to increase in the near future. The current fee-for-service payment system is considered unsustainable. Fee-for-service is a payment model where services are unbundled and paid for separately. In this case, payment is reliant on the quantity of care, rather than the quality of care. Overtime, it became apparent that the fee-for-service model for paying physicians is one of the major factors driving higher healthcare costs in the U.S. As the healthcare industry moves toward reducing costs, more payers are phasing out of fee-for-service and turning to value-based reimbursement models for episodes of care as a part of reforming finances for the industry. Bundled payment, also known as episode-based payment or episode-of-care payment, is defined as the reimbursement of healthcare providers on the basis of expected costs for clinically-defined episodes of care. In recent years, CMS has been creating bundled payment programs such as the Medicare Bundled Payment for Care Improvement (BPCI) program. The BPCI program consists of paying a number of providers based on an episode of care, beginning with an acute-care hospital stay and covering the costs of post-acute care facilities, hospitals, and follow-ups at physician offices. CMS has also been incorporating value-based care reimbursement within the Comprehensive Care for Joint Replacement (CJR) model, which covers the costs of hip and knee replacement surgeries among Medicare beneficiaries. Through the CJR program, CMS has shown that bundled payments can effectively increase quality and decrease costs for joint replacement bundled payments. In turn, progressive payers are seeing success with spine surgery bundles as well. However, the CMS recently finalized a rule to delay the implementation of the CJR model and other bundled payment models to 2018. This way participants will have a more clear understanding of the governing rules and have the ability to take additional steps to adjust any potential changes. 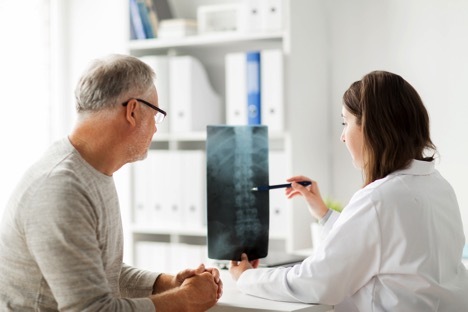 Ventures into progressive models for spine surgery have been supported by the successes established by advanced payor reform programs from the CMS. As a result, due to the success of these programs payors are putting on the pressure to provide cost-effective and quality care. Whether they are focused on lower extremity arthroplasty or spine surgery, these new driving forces are making hospitals and physicians align to improve quality and reduce costs through new structures and relationships. Although progress is evident, Scalise and Jacofsky note that in many respects spine surgery has been years behind the wave of market pressures seen in other orthopedic subspecialties. Bundled payments set a single price for all care required to treat a patient’s particular medical condition. It offers providers a flat payment for a given episode of care, typically covering up to 90-days after hospital discharge. This means that bundled payments cover the facility fee, physician’s fee, anesthesiology, implants, pain management, rehabilitation, and all other care costs for a specific episode of care and time. For example, a set price will be attached to a spinal fusion and will cover only the acute phase of care or a 90-day period that includes post-acute care, making it an easier and more consistent process. Scalise and Jacofsky recommend spine surgeons to recognize and understand the forces driving and motivating these value-based trends in order to better equip themselves to adapt to these growing changes. By recognizing their key components and driving forces, and understanding how to align their organizations, spine surgeons can learn how optimize performance within these programs. Stay up-to-date with the latest industry news and solutions at HIS! By signing up for our monthly e-Newsletter, you’ll receive industry news and product updates on upcoming events, orthopedic and radiology news, industry updates, and helpful resources. Sign up today or contact us for more information!